Crowds arriving on foot and in horse drawn carriages to celebrate the official opening of Hainault Forest. 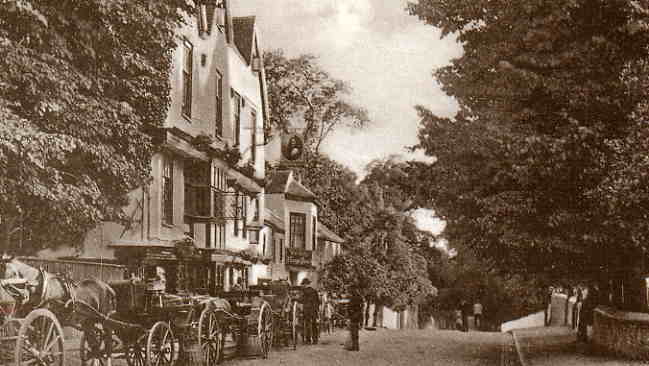 The several entrances to the Forest were gay with flags as was the covered platform where the dignitaries assembled after a carriage tour through the Forest from Chigwell Row Church. With thanks to the London Metropolitan Archives for the use of the photograph. Crowds arrived by carriage and on foot to assemble on Cabin Hill for the Official Opening of Hainault Forest at 3pm on Saturday 21st July 1906 and were entertained before and after the ceremony by the London County Council Parks Band. The President of the Board of Agriculture The Rt. Hon. the Earl Carrington accompanied by the Countess Carrington were met at 2.40pm. near All Saints, Chigwell Row by the Chairman and Councillors of the LCC, Essex County Councillors, Councillors from Ilford and other Towns, The High Sheriff of Essex and Mr Edward North Buxton, together with the ladies, proceeding in carriages into the Forest for a tour of inspection and making their way to a platform bedecked with flags and bunting on Cabin Hill. Mr Edward North Buxton addresses the crowd. Detail from the picture below. Thanks to the London Metropolitan Archives. The Ilford Recorder gave a full account of the occasion in its edition of Friday July 27th 1906 including the history of the forest and the events leading to the purchase. The Chairman of the LCC. Mr Ewan Spicer read an address of welcome to Earl Carrington. In his reply Earl Carrington referred to the forest history and said that it was necessary in this country to preserve all ancient landmarks. "Because a man was a Radical it was no reason why he should not be able to recognise what was beautiful and what should be preserved." He paid tribute to Edward North Buxton to whom it was largely due that this fine open space had been rescued. In conclusion he said, "In the name of the public of our mighty country, in their name, and in the name of their children and their children's children, I declare this magnificent forest of Hainault open, and belonging to the public for ever and ever." There were loud cheers from the thousands gathered round, and the band played The National Anthem. Sir William Collins MP commended the action of the LCC in providing ramparts of fresh air and green fields and verdant forests around the greatest City in the world. The ovation of the day went to Mr Edward North Buxton who acknowledged the many who had furthered the scheme which had been brought to a happy issue. He asked whether he had been premature in promoting the scheme, and pointed out the only ten years previously four miles of green fields divided Ilford and Romford. Now there was housing between and there had been a rapid growth in population. Within five miles of the forest are over 250,000 people. Villages around London were now towns. It was important to secure land while it was a reasonable price. It was a pity that Hainault Station was far from the forest, but Ilford Urban District Council and others had secured 76 acres of land near the station as an open space for football and cricket. Councillor John Bodger, Chairman, Ilford Urban Council proposed a vote of thanks to the Chairman of the LCC and noted that Councils were sometimes criticised, and their proposals occasionally met with opposition, but this act of the LCC in securing Hainault Forest and dedicating it to the people was one of the grandest thing they had ever done; it was approved by everyone, and would be appreciated for generations to come. Crowds listen to the many speakers assembled including, Earl Carrington, Ewan Spicer Chairman LCC, Edward North Buxton, Andrew Johnston Chairman Essex County Council, Cllr. John Bodger Ilford UDC. With thanks to the London Metropolitan Archives for the use of the photograph. 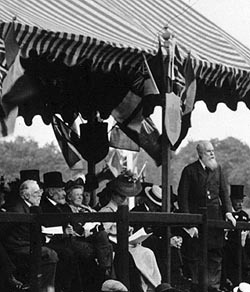 Following the proceedings, tea and refreshments were served to the throng in adjacent tents. A large number of guests of the LCC drove through the forest and were entertained by Mr Frederick Green JP at Hainault Lodge. Councillors Bodger and Griggs of Ilford entertained friends at The King's Head Hotel, Chigwell. The Ilford Recorder. Friday July 27th 1906 Hainault Forest Dedicated to the public use for ever. The London County Council. Order of Proceedings. Pamphlet 4pp. The London County Council. Dedication of Hainault Forest. Booklet 12pp with 7photographs and a map by G.L.Gomme, Clerk of the Council 18th July 1906.